This is just a couple of blocks, part of a small city. This illustration objective is to be used in any situation. 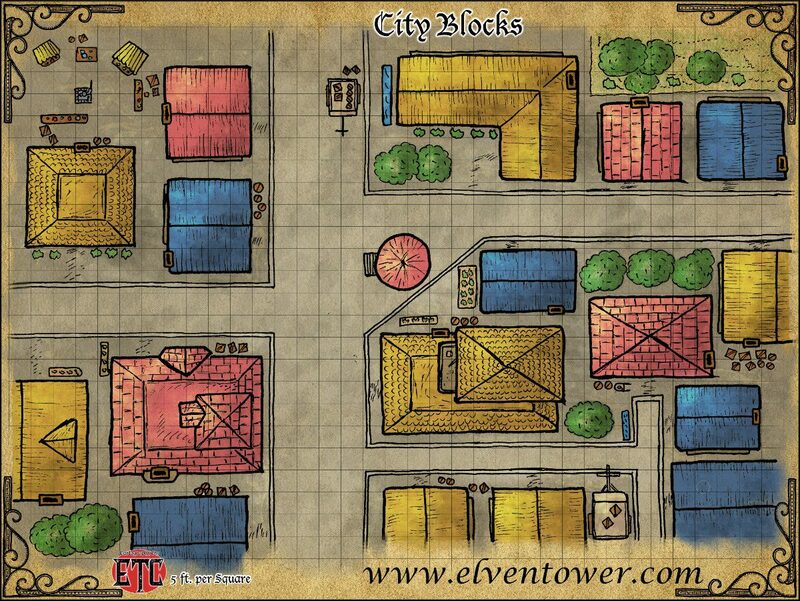 Any time you, the DM, need a streets encounter or any kind of urban environment encounter, a map like this one is very useful. The buildings in the illustration can be named and given a function according to your needs or campaign. Here is a list of ready to use NPC’s to populate this part of the city. Tarneck (Dwarf).- Local Smith of the neighborhood, he specializes in horse shoes and horse armor. Darialli Turfad (human).- Innkeeper of the Rotten Flagon, a very popular place in this part of the city. Ducky Tuck (halfling).- This curious and sneaky halfling earns coins by delivering messages and packages from different parts of the city. Lord Adrian Escherel.- Often enough, Lord Escherel visits this part of the city to buy fresh vegetables from the market. He does it also because he believes the common folk must see their Lord often. He is a fine man and guards accompany him everywhere. Dion Lorenzo.- This individual is well known because he brings quality wines and spices from other towns. Father Roman.- Beloved leader of the local church community, he is respected and reverend as a holy man. You can find this map with tactical grid in High Resolution PDF in my patreon account. There are two versions, with and without grid for combat. My mapping ventures are funded through Patreon, It is thanks to people who like my work that I am able to continue mapping and providing RPG original experiences to people all over the world. If you like what I do, consider getting involved and backing me. What you get is impressive hi-def versions of my maps to be used in your RPG games (these have lower resolution), and the satisfaction of helping the rpg community grow bigger and stronger. Help me get funding and enjoy hi resolution PDF version of my work.